She's a bit of a stickler is Sharon. "What - you want me to change the brake fluid? What for?!" Brake fluid is supposed to be changed every 2 years according to both Sharon's Z250SL manual and my own CB500X manual. Why? Brake fluid is hygroscopic (not hyDroscopic which would make more sense to me). Hygroscopic means that it absorbs water. Brake fluid is not supposed to have water in it. Air has water in it. 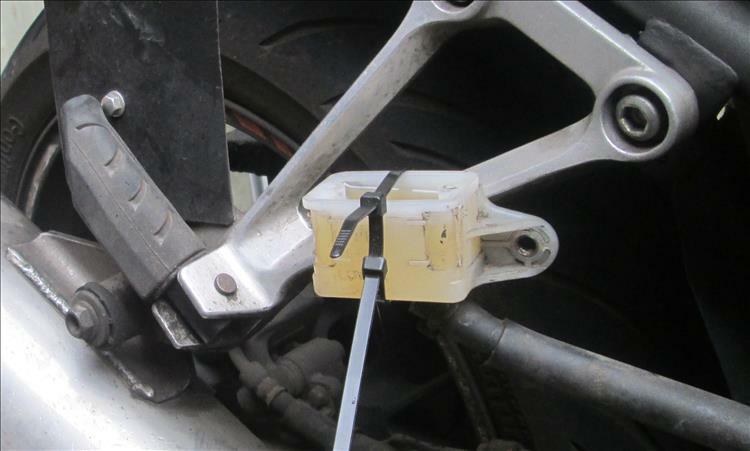 While steps are taken to keep air out the brake fluid system it is inevitable that some air will contact the fluid, usually via the master cylinder. It is a matter of opinion how often fluid should be changed. If you google "why does brake fluid need to be changed" you will come across all arguments, opinions, recommendations and snake oil quackery. BUT! Sharon's manual says 2 years, it's not a difficult job, brake fluid is cheap and if we do it there's no arguments are there. Sharon's Z250SL is the last of the non-abs models. 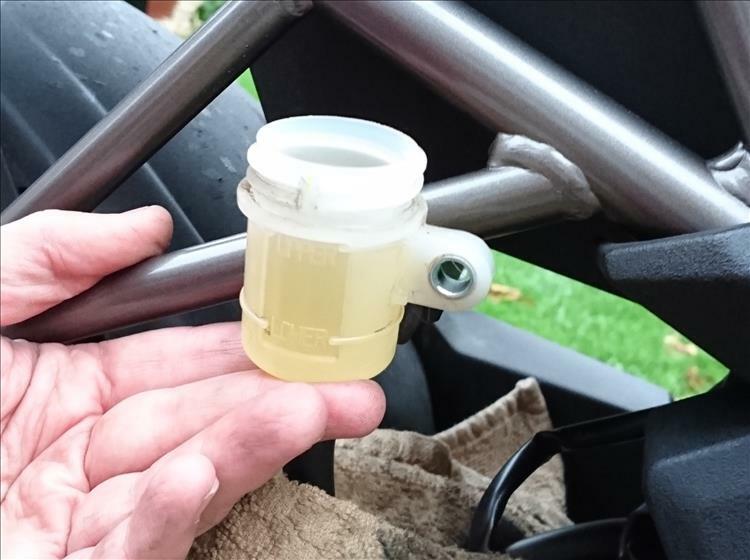 As such it is simply a case of removing the cover from the master cylinder and continuously bleeding the brakes while topping up the master cylinder. We could totally drain the system but I'm trying to avoid any fiddly air locks making the job that much more time-consuming. 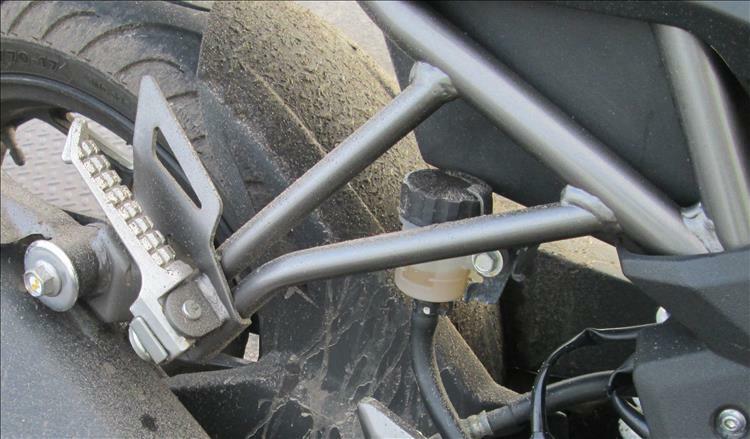 Just check out the radical easy access rear reservoir to the master cylinder. The rear master cylinder's reservoir is tucked behind the rear footrest hanger. Oh. Poop. I consider the idea of using funnels and tubes but what the HELL were Kwak thinking when they put the damn thing there? Talk about making life hard for home mechanics, I bet there's a special Kwakker tool for this job isn't there. I hate it when companies do this. Ah. Erm. Sorry. Yeah erm just unbolt the 1 single bolt that holds the container to the frame and move it on the handy rubber pipe. It's like Kawasaki planned it to work like this. Ah. Yeah. I'm sorry Kwak. Aaaaaah right I seeeee. Sorry. So with both brakes suitably refreshed on Sharon's Kwakker there's still 3/4 of a small bottle of brake fluid left. I sneakily tell Sharon it will go off and quietly snaffle it into my top box. Muuuhahhhahhaa! Back at BAT Towers I realise I may be out of my depth. You see the CB500X does have ABS. There is something in the Haynes manual about connecting some wires together, switching the ignition off and on and off, incantations to Gruki the God of ABS brake systems and then lighting a candle that smells of unicorn poop. However I reckon it's just a normal brake system with longer pipes and a machine of some sort in middle. As long as I don't get any air locks I should have no problem refreshing the fluid the same way as we did Sharon's. The problems would arise if I get air in the fluid because the ABS system may need to go into some kind of "mode" to allow proper purging. I think I might be getting the hang of this new fangled hydraulic rear brake business now. I do this fine. Squeeze out, ensure the master cylinder does NOT go low enough to allow air in, top up, squeeze out, repeat a lot. It may be possible there's a little old fluid trapped in a secret corner of the ABS but as far as I'm concerned it has at least 95% fresh fluid in it. Sorted. There was an issue with one of the screws that holds the master cylinder cover on - but that's for another post. I've honestly never done this, I just wait until I have to clear out the seal grooves which means a fluid change anyway. Did you notice any difference afterwards? No, frankly. But before you ignore your brake fluid for the rest of eternity there have been several bikes where the fluid has been present for longer than 2 years. These did benefit from fresh fluid. It gave a better, crisper feel at the lever. My advice? 3 to 5 years I'd say. It's not expensive and it's not a bad job. To be fair, once opened the brake fluid will 'go off'that hygroscopic thing happens the same in the bottle as it does in the brake system. I tend to agree, cheap and easy, why wouldn't you? If you want the best best best then the fluid should be "freshly opened". I don't think it goes off overnight though, the hygroscopic thingy takes a while. But yeah, why wouldn't you. Anybody reading this thinking, nah, it's b******s.
Here's a long story cut short. About three years ago riding down the Stelvio towards Bolzano when the rear lever starts to go soft, this after only 20 or so hairpins. 2 or 3 later no pedal at all. Luckily the fronts remained OK and I rode accordingly. The fluid in the rear was only about 2 years old. After about 10 minutes the rear brake came back to me. Needless to say a fluid change was performed ASAP. I put it down to a relatively enclosed caliper, fixed luggage and water in the fluid. Once the water boils you have gas not fluid and you can compress a gas. I wasn't riding hard either but having to cover the brake due to rate of descent and tightness of the curves. So that's a very good reason to change and with ABS it's even more important for your wallet, corroded ABS pumps don't come cheap. Well done Ed, you've just saved yourself some money. I had read about corrosion while researching this. Of course on my older non ABS bikes the master and slave cylinders were alloy and the pipes all rubber so if there were water in the system I'd never likely have known. I really must learn the actual how an ABS works rather than the principle.